HAVING a relevant social audience helps build the foundation for a strong social profile. If only there were a way to grow your following? There’s no doubt you have seen the social posts or even received the dreaded direct message pitching such a service. Seems like a good idea? Think again. Paying for followers is a waste of not only time, but money. The only reason those accounts are following you is because they are paid to. That is, if they are even “real” accounts. Most of the time, it’s just a pool of fake profiles controlled by a script to follow your account. In the end, it just fluffs up your numbers while reducing your overall engagement and success of your social initiatives (you are tracking your social media metrics, right?). I mean, they are fake accounts after all. There isn’t going to be much engagement unless it’s automated in the form of likes or retweets. I wouldn’t hold your breath for any real conversations to take place with these accounts. 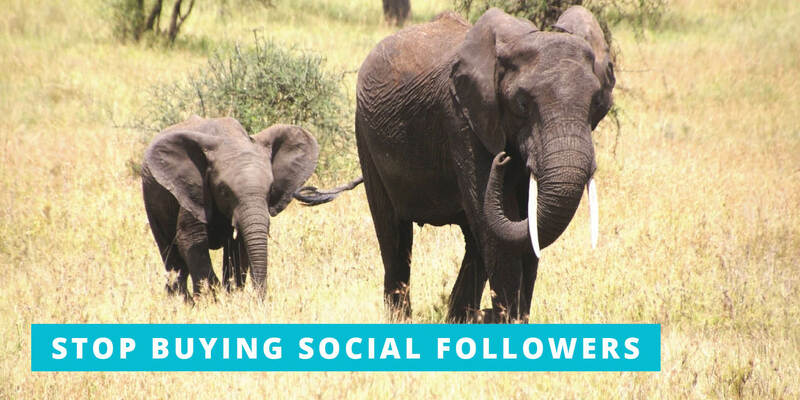 So how can you build a strong, relevant social following without buying followers? No worries, I’ve got you covered in this blog post as I’ll show you 4 ways to build a legit following on most major social media sites. You know the phrase, “The money’s in the list”. And if you follow this (and why wouldn’t you), then you have been hard at work building an email list. Just be sure you aren’t buying email lists! As long as you have been building your email list the right way, this is a no-brainer. 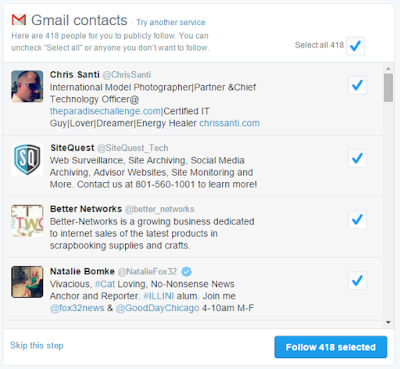 Your email list is full of people who already want to hear from you. If they have already given you their email address, then it shouldn’t be too difficult to get most of them to follow you back. 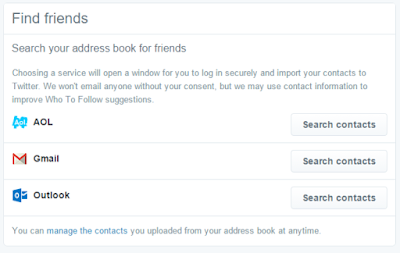 Did you know that you can import your address book to find out which email addresses have a social profile registered to it? For example, on Twitter you’ll need to go here. 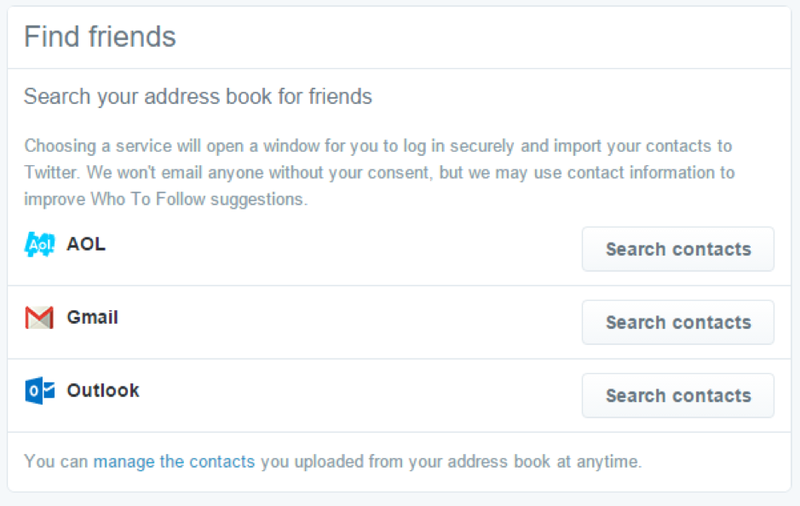 Next, you’ll need to select which service you would like to import contacts from. 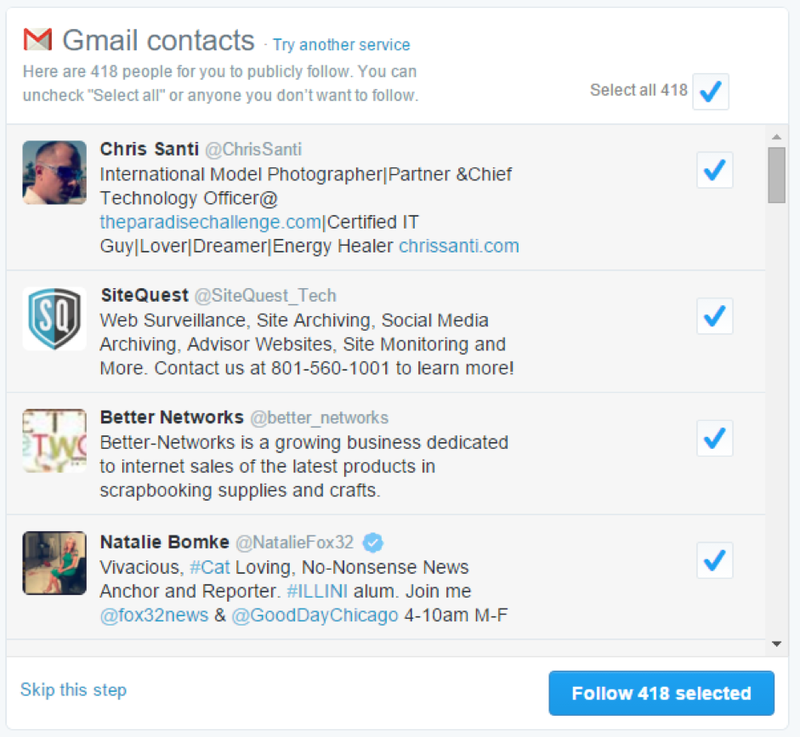 Naturally, your email list probably doesn’t live within one of these options. No worries, you can export your email addresses from your newsletter service (Aweber, Mailchimp, etc) and then upload them to a Gmail account. Then you’ll use this Gmail account to “search for contacts” to import. To do this in Gmail, you will need to go here. In the top navigation menu, click on “more” and then “import.” Follow the steps to complete the import. You can select them all or sift through the list to pick and choose. Once submitted, within a few days you should see a large percentage of these people follow you back. This similar process can be done not only on Twitter, but on Facebook, LinkedIn, and Pinterest to name a few. [Bonus Tip] – Do this once a month to import any new subscribers you get. 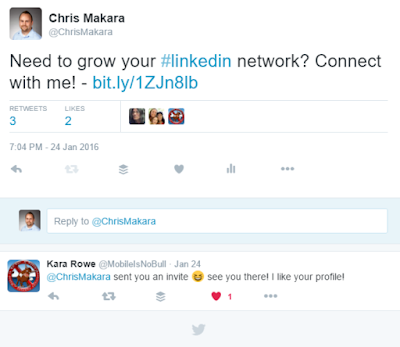 Another easy way to build your social media following is by leveraging the channels you use. Now, this typically works better on your social profiles that have the most engaged users. There’s really nothing much to this, but it works. 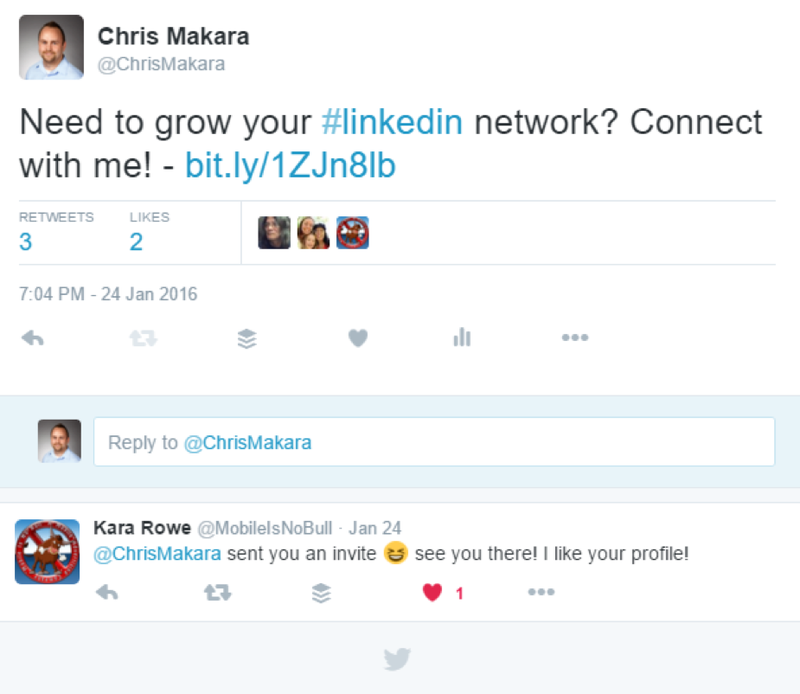 I’ve been doing this for about two years now and it’s helped me to grow my LinkedIn audience to well over 2,000 connections. Not too bad. The trick is to create some evergreen social media content updates with different variations to post. No one wants to see the same exact “Hey, follow me on…” updates. You should come up with at least 3-5 for each channel you want to promote. 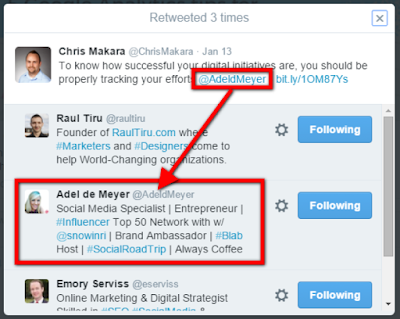 Simply save them in Excel or Word for quick reference when you want to cross promote each of your social channels. No matter what social media channel you are on, you can’t be completely self-promotional. You need to have a good mix of updates that not only promote you and your business, but also promote others. One of the best ways to do this is by sharing other people’s content. Not just anybody’s content, but content of an influencer in the space you are in. Sure, you could just copy and paste the link into your status update and post it. But, one little step can help you reach a new audience. This simple step is simply to tag (or mention) the influencer you are sharing content from. When you post your update, they will not only be notified (or at least see the mention if they monitor their brand), but you increase your chance of being exposed to their audience. There are a few ways this can happen. The first way is that they will reshare your status update to their audience. Depending on the social channel, there are users who monitor mentions of a brand. Through this monitoring, they will see your update and perhaps reshare it or follow you since there is mutual interest in the shared topic. I tagged the influencer and they ultimately shared it with their audience. It not only gave the influencer something to share, but also pushed my name in front of her social audience. Using this approach on an ongoing basis will help expose your name/brand to new audiences. The last tip on building your following is to simply use your favorite social media management tool to set up streams to monitor questions in your industry that you can answer. 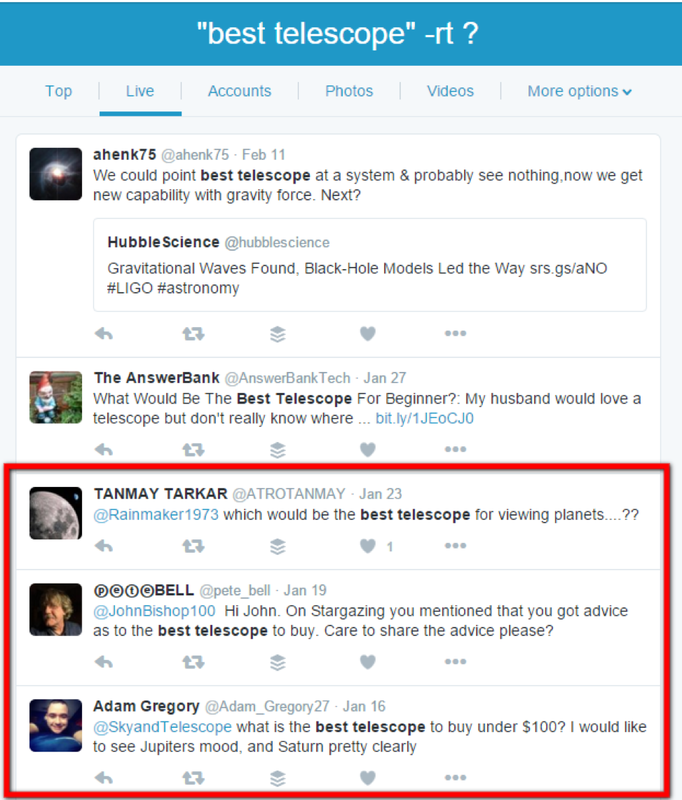 This search string says to search for tweets containing the phrase “best telescope” that is not a RT and has a “?” in it. If you want, you can run the search directly in the Twitter search field. Just be sure to click on the “live” tab to see the most current results. Of course you will need to be timely when the questions are asked (or complaints), but all of these would be a great opportunity to step in and provide an answer. 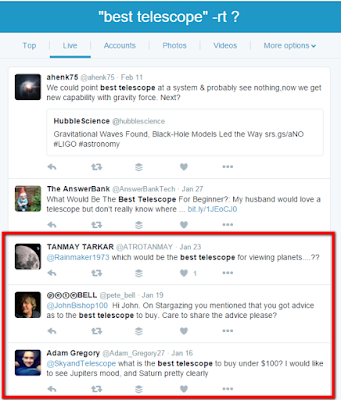 You could also, view the tweet where a user is directly asking the question to someone else. If you see it is unanswered, you can step in an provide one. Unless the user is specifically asking for a price, I would steer away from selling in your answers. Your goal here is to be helpful to the user, gain their trust and ultimately a follow. Success on social media does hinge on the relationships and engagement you can get from your following. If you go the route of buying social followers, your account will no doubt struggle building any real relationships. Some might think it is a quick and easy way to grow your account. However, that is typically not the case. If you are adamant about spending money on building your followers, you can definitely explore advertising through the various social platforms in order to drive new followers of your account. However, you will need to be sure to have your campaigns set up properly so that you can generate legitimate followers to engage with. Using the free methods I have outlined above will allow you to naturally grow your followers with real users. While I only covered 4 ways to build your following without paying for it, there are undoubtedly additional ways to get more followers by only spending the time to do it. What are your favorite ways to build your social following? Be sure to let me know in the comments below.